Congratulations, a potential supporter has made it to your donation page. Your hard work has paid off. You’ve engaged them effectively enough to get them here—the most important stage of the checkout process. But that doesn’t mean you should hit the engagement brakes. With the right fundraising software, your donation page can continue to engage potential supporters throughout the entire process. The customization that a Classy donation page offers can help you connect with donors right up until they click the donate button. This level of engagement can enhance and deepen a donor’s experience with your organization. Here are three ways you can increase engagement on your donation page. A key element of donor engagement is to maintain a two-way conversation. Your donation page could be a great place to keep up dialogue with a potential donor. Adding a comment field is an excellent way to let them share about themselves and their gift. Giving donors the option to share their own story, or reason for giving, helps them reinforce their own decision to donate. It also shows them that your organization is listening, while giving you the opportunity to collect feedback on what motivates your donors to give. 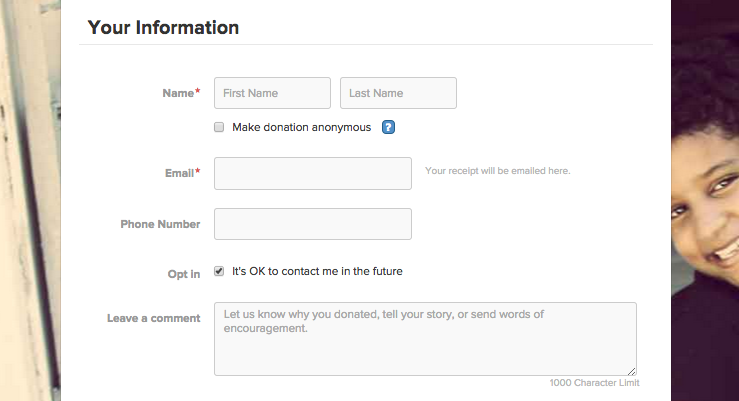 Using Classy, you can include a comment field on both your donation form and individual fundraising pages. When it comes to the latter, you create opportunity for engagement by adding a comment box. It allows third-party donors to easily offer encouragement to their friend or family member, alongside their donation. Many gifts are often made in honor of a loved one, whether it’s for a birthday, wedding, or other special occasion. The experience of dedicating a gift is already special, but you can kick it up a notch by allowing donors to send a personal message with their gift. Rather than being limited to punching in the honoree’s name and email address, Classy enables donors to write a dedication email as well. This can instantly deepen the meaningfulness of a gift to both the donor and honoree. 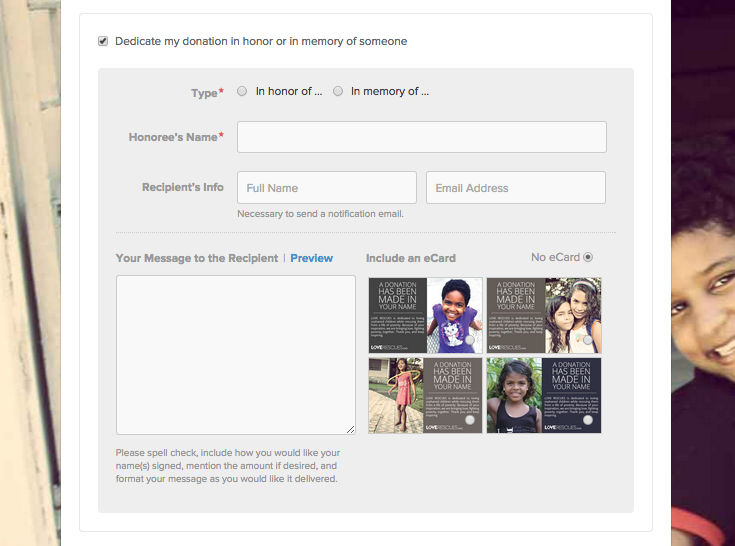 On top of a dedication email, Pro clients can also allow donors to send an eCard along with their gift. This personalized, branded option can give a huge boost to a supporter’s experience with your organization. Whether someone is giving to their friend’s campaign, or to an organization they personally support, all donors want to know the impact of their donation. With Classy, an individual’s personal fundraising page can show supporters just what their gift will do. When a donor enters their gift amount, a progress bar instantly adjusts to show how the gift will affect the fundraiser’s progress toward their goal. This visual helps the donor make a tangible connection between their gift and its impact on the campaign. Not only can an engaging feature like this motivate supporters to lend a hand, it might even affect how much they decide to donate. Don’t stop at the top of the page; connect donors back to their impact all the way down the form. While the fundraiser’s profile image appears at the top of the donation page, it also appears at the bottom, right next to the submit button. This builds on the personal connection between the donor and the person they’re supporting, sustaining that emotional momentum all the way until they click. Your donation page is not an end destination. Turn it into another step in your donor engagement strategy. Give your form the attention it deserves, and you can help reinforce supporters’ decision to donate, and improve their giving experience.